The IQ series is a new generation of plate-amps for active subwoofers. The IQ series features advanced technology resulting in higher power, greater flexibility and ease of use. 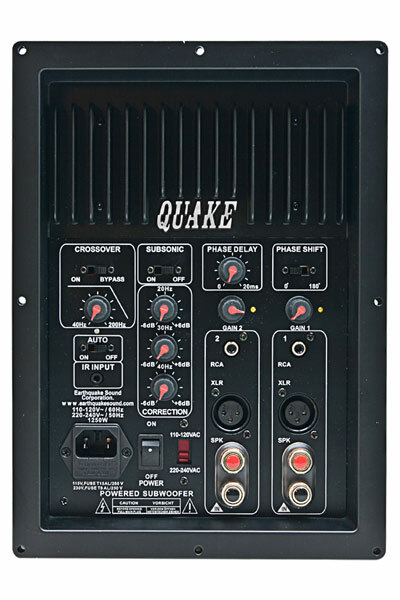 IQ amplifiers are built upon Earthquakes unique class J amplifier circuit with Interface Velocity Controlled Output and Look-Ahead technology. This technology enables high power and continuous operation in demanding 2 ohm impedances. IQ amplifiers are equipped with DSP that contains both equalization, phase and time correction. Overdrive and ODL technology ensures that all power resources are used safely and optimally. For the demanding and uncompromising subwoofer designer - IQ amplifiers represents the ultimate in plate amps. Several manufacturers have some type of room correction built into their plate amps. Most are based on level adjustment by volume which is a very simple equalization function. An equalizer does not address the listening room's phase and time related difficulties. IQ amplifiers have genuine room correction which accounts for reflections, refractions, arrival and equalization. This complete DSP solution ensures optimum acoustic integration in any room. Room correction on IQ amps is simple and straightforward to use. Place the subwoofer at the desired location. Play 50 Hz test tone, through your speakers and sub.Turn the phase delay dial until the maximum output is reached. Use the phase switch button to turn the phase 180 degrees, then rotate the phase-delay dial until the highest level is reached. The setting 0 or 180 degree phase that needs the least amount of phase delay to achieve the highest level is the optimum setting as it will give the smallest group-delay. Now with the phase-related correction completed then normal equalization with the 3 band equalizer can be done. The patented Class J technology manifests a quantum leap in amplifier technology. The revolutionary aspect of Class J is its ability to combine a high efficiency of 99% with extraordinary bass control. Class J is an evolution on PWM technology that combines advanced multi-level feedback with an intelligent controller. It modulates the supply voltage and output switching frequency in real time based on the frequency and amplitude content of the input signal. This added level of intelligence to the amplifier offers several obvious advantages such as increased thermal headroom through the amplifier's optimum energy use, dramatically improved bass response and dynamic power capabilities. This results in a harder audible impact that adds a drive to the sound normally experienced only at live concerts. The patented technologies combined with a dramatically oversized power supply makes the IQ amplifiers capable of delivering raw quantities of continuous power. The power supply is based on a stiff silicon-steel hard-wound low regulation toroidal transformer. The large and heavy transformer ensures a stable power supply without voltage drop even under rigorous and continuous operation. 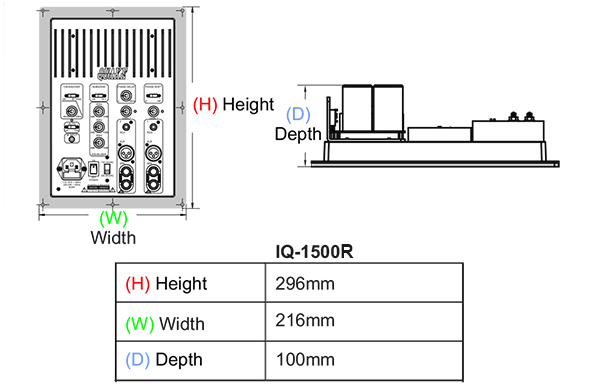 IQ amplifiers operate with ease in demanding 2 ohm impedances. The ability drive in 2 ohm makes it possible to connect multiple 4 or 8 ohm woofers to a single amplifier. At present the IQ series of plate-amps are the only consumer available plate amps capable of running continuously at 2 ohm. Overdrive is a patented system that gives the amplifier exceptionally high dynamic output. The starting point for the Overdrive system is a constant monitoring of all amplifier power resources coupled with an intelligent dynamic high voltage supply. Information from the power amplifier is translated by the overdrive system into a dynamic power matrix which calculates the dynamic power potential in real time. A traditional amplifier will attempt to reproduce a transient signal although its duration exceeds the amplifier's resources which leads to speaker damaging distortion. Overdrives patented design ensures distortion-free amplification combined with optimal and safe use of all power resources. Sound is dynamic by nature- making optimization of dynamic power resources essential. The patented Optical Distortion Limiting circuit is a novel design that provides full protection against distortion. The unique aspect of this design is that the audio signal remains immaculate, as ODL is not in the signal path. Traditionally, the signal runs through the protection circuit thereby complicating the signal path. ODL insulates the protection circuit behind an optical coupler. The original signal continues untouched to the amplifier section. The signal is translated into light where ODL compares it with the power amp section. The use of light gives ODL a response time unattainable by conventional designs. If ODL detects an overdriven signal that can not be amplified nominally or by Overdrive, ODL ensures distortion-free amplification by adjusting the drive level in real time. Adjustable 24dB lowpass filter with bypass. Selectable subsonic filter at 25Hz with 12dB slope. No reproduction below 10Hz via modulator limitation.